Just like they change their watches when they arrive in the new timezone, the Irish coaches should change their calendar. It’ll require something of a suspension of disbelief, but Declan Kidney should select his squad for the NZ tour in June with the same motives in mind as Steve Hansen: it’s the start of the New Zealanders’ preparation for the Tri-Nations, and for Ireland it should be the start of their international preparations for the next Six Nations. Ireland will play five test matches between now and the kickoff of the Six Nations against Wales on 2nd February 2013: the three tests against New Zealand in June, and two against South Africa and Argentina in November. It’s not a whole lot of games when you consider that their warm-up for the recent Rugby World Cup took in four matches in four weeks last August. The focus in the five matches should be on creating better depth and instilling a better gameplan. Even taking into account the retirement of Lions David Wallace, Jerry Flannery and Shane Horgan and the unavailability of Tommy Bowe and Luke Fitzgerald, The Mole is optimistic about the playing personnel available for selection to Declan Kidney. More players need to be taken into the fold and exposed to both the ins-and-outs of the Irish set-up [how the team wants to play, how they train under Kiss, Smal and Tainton, how they interact with one another, with whom they share meals and rooms, what they can expect to do when called together in Carton House during the season] and the intensity of test rugby. Winning these five games should not be the primary aim. The primary aim should be winning the next Six Nations. This is a difficult but achievable goal – exactly the standard of goal one should set. Declan Kidney took the short-term approach of keeping his World Cup squad together to have a crack at the following Six Nations. The Mole can definitely see the argument in favour – after all, they put in a hell of a lot of work together before and during the tournament and bonded well as a team – but unfortunately it didn’t work out. Not only did Ireland not win the tournament, but the combined record of the only teams we beat [Italy and Scotland] was one win from ten. We beat two poor-to-ordinary teams. Relying on one group of players did not work. Paradoxically, Kidney’s conservative decision was a risk, and one that didn’t pay off. The Mole recognises that in order to win tournaments, you need a team based around a core of experienced, talented players. The next five tests that Ireland play aren’t in a tournament. The Mole isn’t suggesting that a team full of inexperienced tyros take the pitch against the All Blacks three games in a row in some sort of youth sacrifice. It’s a three test series, and the the first test will be the best time to catch this new All Blacks team off guard – after all, New Zealand haven’t played a single match since the World Cup final, and Steve Hansen’s recently-selected training squad has a number of personnel changes. Declan Kidney can’t avoid the fact that it’s the end of the season and that none of our players will be fresh; most of them will be fatigued. However, being jaded is a different phenomenon than being fatigued. One is a psychological phenomenon, the other a physical phenomenon. Fatigued players can be managed effectively by rest, selection and substitution. Don’t run them into the ground with two-hour training sessions; rest can be more important than effort at this end of the season. Don’t start them in game after game; introduce competition by giving the start to a guy who has been largely a back-up. Don’t expect them to last the full eighty every time they take the pitch; bring their replacements off the bench earlier than you typically would. The idea that Ireland have one team capable of beating the All Blacks – and that if we just keep picking them, they’ll get the job done someday – needs to be left behind. Analysis plays a huge role in the professional game, and anybody who thinks that you can just go out and “play your own game and let the other team worry about theirs” is divorced from reality. That’s just not how it works. There are two routes to hamstringing your opponents’ analysis: change selection or change tactics. Steve Hansen is too thorough and experienced a coach not to have broken down Ireland’s disappointing Six Nations campaign piece by piece, and even if his players haven’t been paying a huge amount of attention to Northern Hemisphere rugby since their Super Rugby season kicked off, they can rest assured that their new coach will have done all that work for them, and that he’ll have a game plan in mind to continue the All Blacks’s unbeaten streak over Ireland. Somebody told The Mole recently that New Zealanders look at the Irish team the way Irish rugby fans look at Italy: there’s some good players there and they’ll give you a scare once in a while, but you should never lose to them. That doesn’t mean that the All Blacks will be casual in their approach to the game. With a new coach and several new faces in the squad, there’ll be a huge amount of self-imposed pressure to perform. There’s also the fact that it’s their first game as defending champions of the world, and that they don’t want to be the first All Black team to lose to Ireland. The Mole isn’t an especially pessimistic chap when it comes to Irish rugby, but he can’t see that Ireland have much of a hope of bagging a win in New Zealand. Having kept a close eye on the Kiwi teams in Super Rugby this year, there’s no doubt that there’s a new crop emerging to challenge for the jerseys that Brad Thorn, Jerome Kaino and Mils Muliaina have left behind them. Depth is never going to be an issue. With a new coach and a dozen new players named in the training squad, hunger isn’t going to be an issue. With Richie McCaw, Kieran Read, Dan Carter and Conrad Smith on board, experience isn’t going to be an issue. Declan Kidney can stick to his usual routine and put out the same players for three tests in a row, or until they start to fall apart, and what will he have learned? Nothing. On the other hand, he could look to use this as a staging post for an assault on Wales’ Six Nations trophy by opening up his selection policy, shutting the door on RWC11 and 6N12 and looking to February of next year. 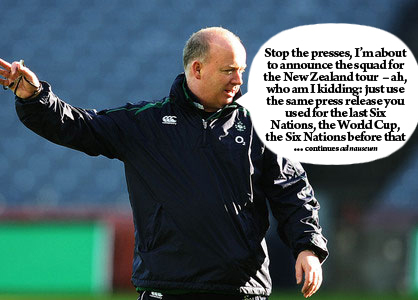 This entry was posted in Opinion and tagged Declan Kidney, Ireland, New Zealand, Steve Hansen by dementedmole. Bookmark the permalink. We may not play the All Blacks in their backyard again for another twelve years. That makes it the equivalent of a Lions tour. Absolutely no planning for the future should be involved. Ireland should pick the best players to win these games as they will never have the same chance again. It would be tantamount to disrespect to do otherwise. Don’t worry HenryFitz, absolutely no planning for the future was involved!